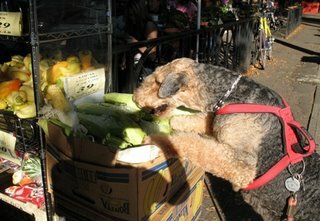 Life of Miss Sunshade - The Vancouver SuperDALE: How do you eat your Corn on the Cob?? Answer the question in whichever way you prefer, and tag 5 more friends!! Now, to answer the question, you may need some help from your hoo-mans like I did today!! I sent mum an instant message to tell her that I REALLY needed to go grocery shopping so she better come home soon. 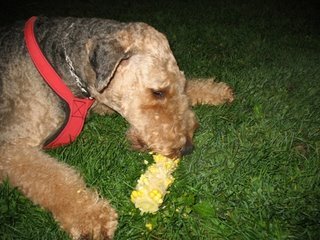 My very well behaved mum zoomed home and took me grocery shopping for the perfect corn on the cob!! I told mum I wasn't gonna take the discrimination from store 2, so we went back to store 1 to pick my corn. Look at the BIG, FAT corn I picked!! I wasn't gonna let mum take it away.... OH NO NO NO! 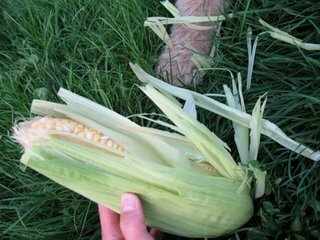 For my littler buddies, you may not want to be as greedy as me and pick a smaller, slimmer corn, or have your hoo-man cut the corn into smaller pieces. 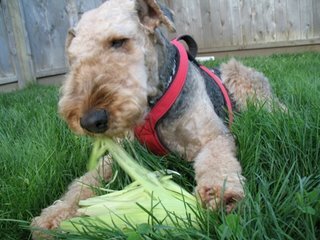 Since mum was so slow, I decided to take it upon myself to peel the skin off my corn!! Cooking time! Mum can't cook, so she decided to boil the whole corn....... 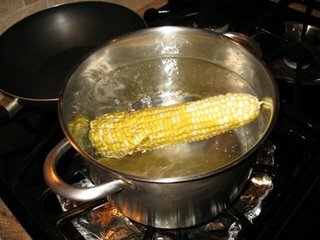 I heard steamed, and grilled corns are also very yummy! Do you eat the corns first, then the cob? Do you eat the corn and the cob at the same time? 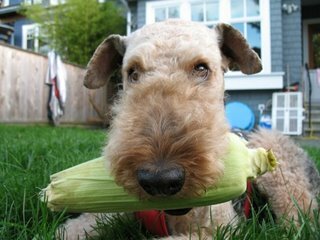 Do you look at your hoo-man, and tell them to pick the corns off the cob for you to eat? Do you turn your nose up all together? Do you eat it MY WAY?? And leave the cob behind? **WARNING: don't be alarmed if you see bits of yellowy stuff in your poop the next day, because.....YOU WILL!! So you don't eat the cob? Was that steam coming of the corn in the video? I assume the corn was quite tasty? Being an actress, I would think you would get things like caviar and champagne! Oh, wow!, that looks fun!! I love corn too. And you're so clever to peel the skin off the corn. Can I send you my corn to peel next time. :) I'll share them with you. just wanna let you know that i dropped you a personal message on multiply. HM doesn't know hwo to send you a message to you on your blog :p hee..
Hi Sunshade, that looks like great fun! Can I like the butter off your face? ps. I'll have to talk to my mom about getting corn. My mom and I enjoyed watching your video this morning. What a great way to start the day!! But now we have a craving for corn!! Maybe I can ask my cockatiel brother, CC-man, to take my place.. that bird likes to eat! I just sniff and stare at it and then pushed it around the floor. and get nibbly bites everywhere just not a corn dog!! OK, I'm gonna get mom to get some corn so we can try it too... this will be my "first time"! I bet I would eat corn like you do! After all I shell my peanuts and pistachios before I eat them. But I bet Mom won't buy me corn because my sister Chani wolfs everything down and she'd probably try to inhale the cob!!! Corn? I think that's something I have never tried! Great job on the corn. I don't like corn I'm a meat kinda guy. Meat is all I will eat. I don't like corn. I am very finicky. 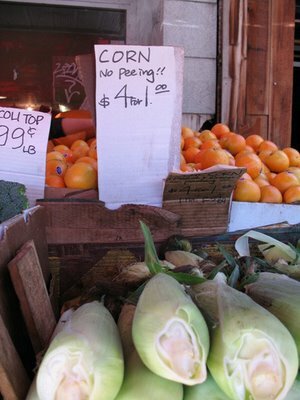 I can't do corn - it gives me projectile poops. I don't think you'd want to see pictures of that, now would you? Too bad cuz it does taste good! I eat it cob and all - I do tend to do everything overboard - real fast before anybody can find me. ps - of course I have only scarfed corn dogs, never just the plain nekkid stuff. 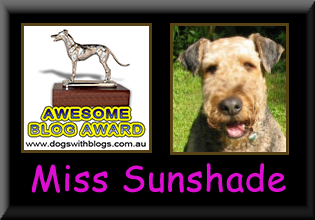 Hey Miss Sunshade, you are one foxy lady! You Rule as Corn Eater! My secretary is a Cornhusker, so you 'guys' have something in common. Coools! My dad can enter the cornfield first, husk the ears, your mom can cook'em and you can eat'em. A smooth operation. Let's go mow'em down! I'll play watchdog and eat my CHEEEEESE! Reeeeally cooools vids! A Golden Palm in your future? Can see why you won the 'Awesome Blog Award' Congrats!!! Cooools! P.S. Thanks for sniffin' around my place. May I add you to my Paw Pals list? Heya Sunshade! 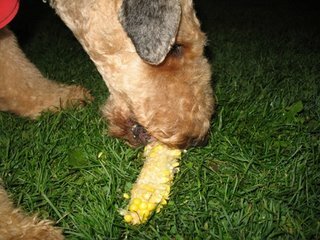 I wish mum would feed me some corn on the cob! 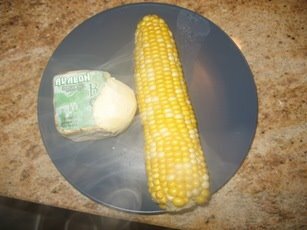 I'd prolly eat the cob tho! Heh. How'd you learn that BANG! thing?! Sunshade, you are the Master Corn on the Cob Eater! I have never seen anything like this. Do you also eat popcorn? Did you have to floss your teeth after you ate the corn on the cob? Hey Sunshade- I don't eat corn but I did try your mum's Turkey Parme Biscotti. My mom made it up today. It was soooo yummy! She even tried some herself and said it was good. Let us know if your mum has any other good food recipes! Isabella: yes that's steam you see coming off from the corn. The corn wasn't hot, it was just warm, but air was very cold.... Sigh, us atresses have hard times too..no caviar today. 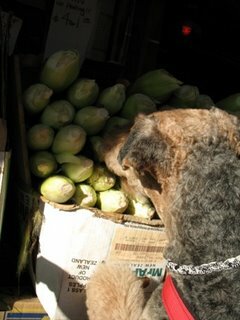 Fufu: I would be more than happy to help you skin the corn! You are special!! Charlie & Jay: it was really fun and YUMMY too!! 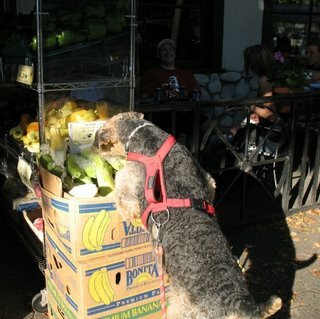 Chiyo: doggies aren't allow "in" grocery stores here too, but some produce stores put their stuff out on the street!! My boyfriends Mackie and Max: of course you can lick the butter off my face Max......*blushing*, and Mackie, you've GOTTA try it with butter!!! T-man: I'm starting to think there's something wrong with Georgie. Both CC-man and Fufu like corns, but not Georgie! Chicote: I'm love to eat MEAT too!! But I do love my corns tho! Chelsea: yes we dont' want to freak your mama out. 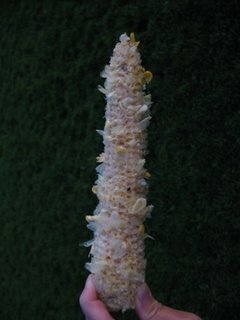 My mum was *almost* freaked out today at the sight of corn-poop..hehe! Buster: um.......okay...dont' try the corn PLEASE. No projectile poops thank you very much. If you score some corn dogs, send a couple this way ok? Thanks George, your Fritz is quite adorable too! Oh Freda: You're so lucky our dad's a cornhusker, I'm moving over! I can help him with husking, and mum can stay home cause I don't really need the corns to be cooks...I sometimes can't wait and just eats them raw..
Hey Liberty: Welcome back to bloggerland!! Hehe Opy: does the cob taste good?? Maybe I need to try it next time. C-K-C: isn't TPB the best?? I see your mom and my mum have something in common, they both tried the TPB LOL. Thanks for visiting my blog! !